Recently we were in touch with Greg Prato, author of 'The Eric Carr Story'. If you haven't read the book yet click here, click on the book title and you'll be able to read two chapters! All reports from the media and fans alike is that the book is not only a fantastic insight into Eric Carr but also a good look into KISS during the non make-up years. KAA: How long have you been writing for? Greg: I've been writing since 1997. It was a good time to start music writing, as it was during the "great internet boom," and I was able to get a foot in the door writing for All Music Guide, a site that I still write for to this day. I've been a music fan for years and years though, so looking back, I guess it was only natural that I would become a music writer, and eventually, a book author. KAA: When did you first become aware of KISS? Greg: In 1978, when I was in kindergarten, a friend at my school bus stop brought "Kiss trading cards" to show everyone, which I found very intriguing. Afterwards, my mother bought me the first Kiss album as a kindergarten graduation present, and then in the summer of 1979, my father was kind enough to take me to see Kiss on the 'Dynasty' tour at New York's Nassau Coliseum (with Judas Priest opening). That sealed my fate regarding being a longtime Kiss fan. KAA: How did the book come about and how long was it in the making? Greg: I've always been a gigantic fan of Kiss' 'Creatures of the Night,' which I feel is Kiss' most underrated album. And it was Eric Carr's John Bonham-esque drum sound that played a large part in making that album so special. So probably because of that, I've always been curious to read about his life story. Also, I've heard conflicting reports and rumors about what exactly happened during the last year of his life (1991) when he was battling and eventually succumbed to cancer - if he was still a member of Kiss, if he was fired from Kiss, what his relationship was with the other members of the band at that point, etc. 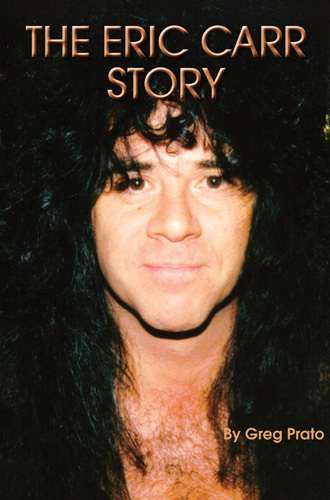 To the best of my knowledge, 'The Eric Carr Story' is the first book to delve inside and tell Eric's true story (which has been confirmed by very positive feedback from Eric's sister, Loretta Caravello, and Eric's girlfriend, Carrie Stevens). And 'The Eric Carr Story' also doubles as a book about 1980's/non make-up era Kiss - something that most Kiss books currently on the marketplace usually skip right over or barely talk about in great detail. KAA: Do you have a favorite interview from creating the book? Greg: Several. Probably tops was speaking to original Kiss manager Bill Aucoin, just a short while before he passed away from cancer. He was super nice, and was very honest and open regarding his memories of Eric and Kiss. Another great interview was Gary Corbett, Kiss' touring keyboardist, and one of Eric's best friends. It was also cool to speak to producer Bob Ezrin about 'The Elder' (he discussed what the album's storyline was all about - I think the first time anyone has done that) and producer Michael James Jackson about 'Creatures of the Night.' I also interviewed renowned musicians who were friends or acquaintances of Eric (Carmine Appice, The Ramones' Marky Ramone, Anthrax's Charlie Benante, Dream Theater's Mike Portnoy, Twisted Sister's AJ Pero, etc. ), and it was cool to hear their stories/memories. Eddie Trunk (who was friends with Eric) and Bruce Kulick had some cool stories, and Loretta Caravello and Carrie Stevens had some great stories about who Eric was outside the Kiss world. KAA: Was the overall process of putting the book together straight forward? We're there any unexpected challenges or interviews you were looking for but couldn't get? KAA: Reviews we have seen have been very positive, particularly around your writing style. How have you found the reaction to book from fans? Greg: I have received nothing but overwhelmingly positive feedback regarding 'The Eric Carr Story.' As with many of my other books, 'The Eric Carr Story' is set up in the "oral history format," which means it's a collection of quotes from the people I interviewed, pertaining to certain subjects. As a result, it reads like a documentary...but in book form. I like using this format the best, because you're getting the true story straight from the people who were actually there. KAA: Have you heard any feedback from the current KISS members in relation to the book? Greg: Bruce has received a copy of 'The Eric Carr Story,' but the last I spoke with him, he has not had a chance to read it (he was getting ready to go to the NAMM show at the time). I have no idea if Paul, Gene, Tommy, or Eric have seen the book or what their thoughts are about it. KAA: You've written a number of music related books, what's next? Greg: Along with 'The Eric Carr Story,' I have another new book out that will be of interest to Kiss fans. It's called 'MTV Ruled the World: The Early Years of Music Video,' which focuses on when the music channel first went on the air in the US, and traces from 1981-1986. For this book (which is also set up in the oral history format), I interviewed Mr. Bruce Kulick, who offers his thoughts about the channel and certain videos/bands throughout the book, including memories of filming the video for Kiss' "Tears Are Falling," and there is a chapter titled 'Kiss Unmasks on MTV,' in which a variety of musicians recount their memories about when Kiss appeared on the channel for the first time without make-up. I spoke to quite a few renowned rockers for this book, including Judas Priest's Rob Halford, Rush's Geddy Lee, Def Leppard's Joe Elliott and Phil Collen, Ratt's Warren DeMartini, Lita Ford, Heart's Ann Wilson, Ozzy/Quiet Riot's Rudy Sarzo, Triumph's Rik Emmett, Weird Al Yankovic, etc. I am also working with Carmine Appice on his autobiography, which is coming out GREAT. That book will also contain a chapter about Carmine's relationship with Kiss throughout the years (he played on Paul's 1978 solo album, and he played in a few bands that opened for Kiss over the years). You can find ordering info (and read samples of the book before purchasing) for 'The Eric Carr Story' and 'MTV Ruled the World' by going to http://stores.lulu.com/gregprato and clicking on the appropriate title. KAA: Thanks for the interview Greg, it's been great to hear from you! Greg: Thanks for the interview! Don't forget - head over to Greg's store on Lulu and check out all his books, along with extracts! Click the logo below to head straight there.